It’s been a while since I posted here. I’m not very good at accomplishing things that I don’t feel like doing, and I just haven’t felt like blogging for a few months. It’s been a combination of adjusting to a new job and schedule, traveling quite a bit, and needing a break from staring at my computer 24/7. But now I’m back — and hopefully will be regularly. 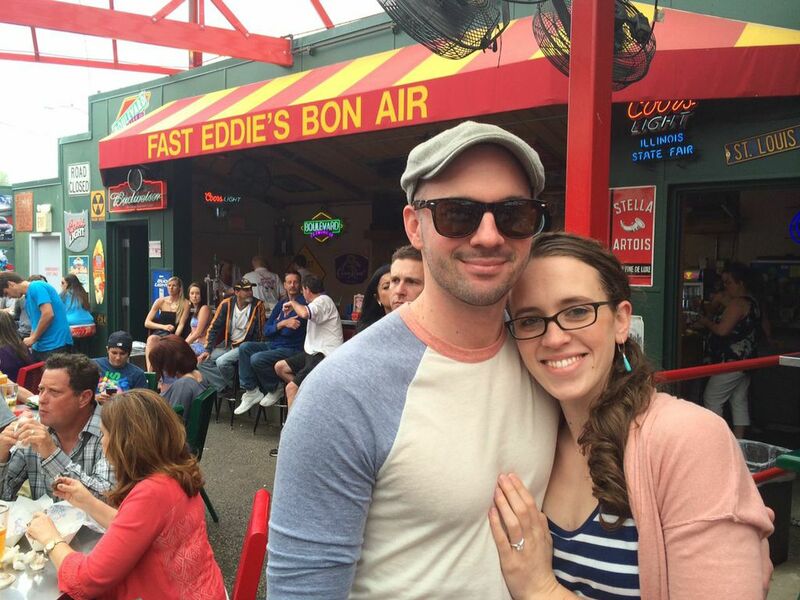 Despite the misleading appearance of this picture, no, we did not get engaged at this bar — this is from the next day! We are getting married next October (2015) in Kansas City, and we are very excited! So, there may end up being a few wedding planning posts on here, too. They won’t all be food related, but there should be a few of those, too — I’m planning to host a morning-after brunch for out-of-town guests and close friends… and I’m cooking everything myself (well, with my mom). If I can’t get my sh*t together enough to share recipes beforehand, there will certainly be photos & recipes after the fact. 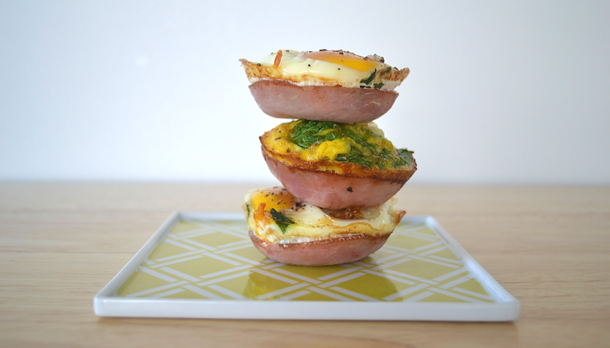 Now back to these bacon-and-egg cups. I put together this recipe the week before my first day of work back in March as a way to streamline the whole “breakfast” thing while I was getting used to my new schedule. They’re simple, packed with protein, and completely delicious. I tried these two ways — three cups used whole eggs, and for the other three, I beat the eggs before adding to the cups. I opted for spinach and cheese filling and Canadian bacon bottoms, but you can customize these with whatever you’re in the mood for or have on hand. If you want to use regular bacon bottoms, go for it — just make sure to line the sides and bottom with slices to avoid egg filling leakage. If you’re not in to spinach, tomatoes, broccoli, kale, peppers, onions, or really any other veggie (or more meat, for that matter!) will work just fine. These are perfect to bake ahead of time, store in the fridge, and heat up for 15-30 seconds in the morning when you’re ready to eat. They should keep for about a week in a tupperware container in the fridge. Scroll down for the ingredient list and recipe instructions. Enjoy! Cooking spray, oil, or butter. Preheat the oven to 350. Grease six muffin cups with cooking spray, oil, or butter (your choice). If you are using whole eggs: On top of the Canadian Bacon, place 1/6th of the cheese and 1/6th of the chopped spinach on top of the bacon. Crack an egg into each cup, and sprinkle with salt and pepper. If you want to use beaten egg filling: In a small bowl, combine the eggs with a bit of salt and pepper. Beat until well combined. Stir in spinach and cheese. Pour the mixture evenly into the six cups. Bake for 10-15 minutes, or until the egg whites (or beaten egg) appear to be completely set. If eating immediately, let cool for 2-3 minutes, and enjoy! If saving for later, let the cups cool completely before storing in an air-tight container. 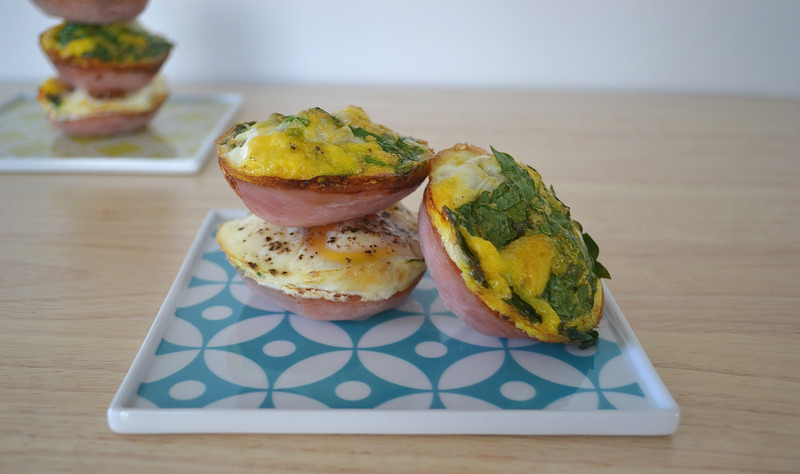 Tags: Bacon, Breakfast, Brunch, Canadian Bacon, Egg, Engaged, Muffin Tin, Portable, Portable Breakfast, Spinach. Bookmark the permalink. Can’t wait to make these. Fun and easy!